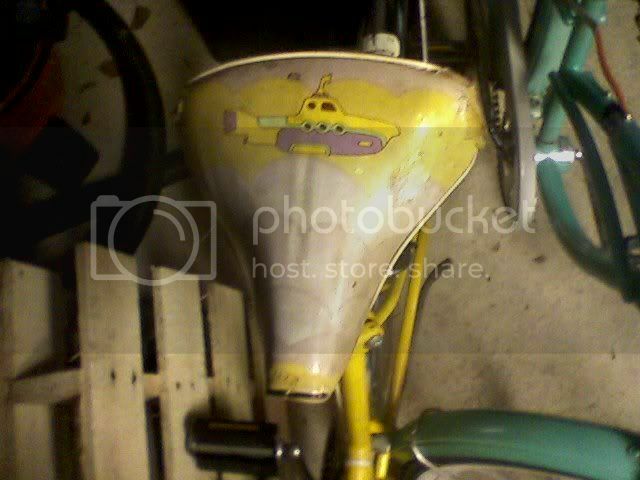 Beatles yellow submarine 1968 Huffy bike. maybe for sale? but I was wondering, how much would someone pay for it? I'm not sure how much it could be worth, but I would go easy on cleaning/restoring it. It could devalue it if not properly done. Wow, Yellow Submarine existed in 1869? That probably would be worth quite a lot, if you restore it. But like Skye said, it's probably best to get it professionally done. Shannonmac - could you post some more pictures please? I don't know anything about this, so couldn't tell you what it's worth, but I'd love to see more of it. Here's a link of someone selling one, and it has a picture too. They're selling it for $650, but I think you could sell it for a bit more.